Every Guinea Tells A Story. Looking around the rescue guineas here there is a selection of short stories waiting to be told. Some very sad, others unavoidable, a few are downright criminal! Eventually every story, no matter the type, will turn into a fantasy one with a happy ending. Before the story can move on there are a few inevitable chapters that must happen, some stories contain more than others and some are more dramatic- but the lead characters are as important in each one. Where there is a tragic ending it is hoped that the moral of that story will live onto help others. Blossom’s Story: Blossom arrived with 17 other guineas, her Humans had bred them because it seemed like a good idea at the time and pet shops were willing to take any excess babies. Unfortunately the demand from the pet shop was smaller than the amount of available babies and the situation got out of hand. Blossom arrived in comparable style- a 3 foot hutch containing her and her 4 day old pups, the other 15 were in 2 washing baskets with towels draped over the top. Poor Blossom was in an horrendous state, she would just sit there hunched feeding her two pups,spine protuding through the few hairs that were left on her back- this was more than maternal hairloss. For the first few wheeks she bunny hopped around looking utterly pathetic but so needy and knowing. A Human that had recently adopted a sow from me offered to help, as well as fostering two sows she made me some guinea friendly shampoo that she thought might help. I was trying veterinary products with no luck so thought it was worth a try. Blossom responded to treatment and grew a fuzz all over her body. 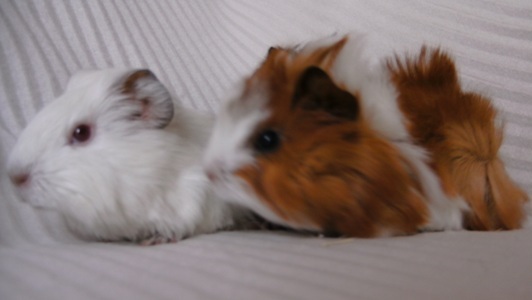 As did the two foster pigs taken on by the Human that made the shampoos- but thats another story…. Blossom was rehomed with her daughter Dixie to live free range in a large shed. Monty arrived here on his own in a lovely blue cage, all new and with mineral licks and salt stones hanging from the bars. Treat sticks were scattered in his cage and a couple of seed ones also hung from the bars. These were immediately disposed of- immediately after the papers were signed and Monty was a rescue that is. Monty had belonged to a young Human, about nine, and the parents had bought a waterbottle with a float in the top so he could see when the bottle needed refilling (Every day people, every day! More often and you need a bigger bottle!). Monty was just 12 wheeks old on arrival, having spent just 2 wheeks in his new home after leaving the care of the pet shop the Humans found one of them was allergic to him resulting in the need for him to be rehomed. Monty is a Satin guinea pig who was sold with no warnings of what might lie ahead for him should he go onto develop Osteodystrophy- but then its quite likely that the pet store in question had no knowledge of OD. Monty has since been rehomed with a lonely sow and with Humans that have been told OD is a possibility, their vet is knowledgable about OD in guinea pigs and has seen and treated previous cases, should the need arise he will be in good hands. Bert and Ernie were no strangers to rescue when they arrived here, this was their second stay (that we know of) in a rescue. They were previously kept in an outside run all year round along with several rabbits that were also surrendered. The run became a total mud bath and uninhabitable, the ground was attracting rats and Ernie had several bite wounds on his legs and feet that our vet identified as rat bites. Bert was a good weight, though Ernie was scrawny. The bites on Eries legs and feet turned to abscesses and slowly merged into one on each foot. They needed lots of flushing out twice daily and with the help of Manuka Honey and Baytril the last one went! But not before the threat of possibly having his foot amputated to stop the spread. Bert and Ernie went to live out their retirement with a family they could call their own and where they were the centre of attention. So Nibbles and her friends arrived that evening, some went elsewhere the next day. Nibbles did well, she responded to the treatment for mites and her hair grew back lovely, she put on a pound in weight (she weighed just over a pound on arrival) and began to appreciate that there would always be another meal she didn’t have to eat everything all at once. When I felt a mass in her abdomen I checked the dates to see if we were about to welcome some mini pigs but the dates said that was impossible, so it was a visit to see James and see what he could make of it. Nibbles had an internal abdominal abscess that stretched across her abdomen. It was a case of do or die- so we did. James is an excellent surgeon and I had every faith in him. Nibbles came through the op well much to James’ delight too, but half an hour after coming round she had a cardiac arrest, fortunately James was on hand and brought her back, all was well. Nibbles was in the local and national papers and visited some local schools doing fundraising before retiring to a life of luxury here on Planet Guinea. If the ages given were correct, Nibbles died when she was six. If there was ever an undervalued little soul it was Nibbles, some guineas are special, extra special and Nibs was one of them. These are just a few of the Guests that have stayed here, there are many more stories that can be told, and many waiting to be written. Though we can’t often dictate the beginning lets try and be a positive influence on those stories we are lucky enough to be part of….